New Saint Petersburg is an art exhibition that presents the work of young visual artists from the city of Saint Petersburg, Russia. On the occasion of the year of the Netherlands and Russia 2013, the exhibition showcases a new generation of talented artists. The exhibition presents a selection of works by young artists who are connected to four independent art organisations in Saint Petersburg. Five FotoDepartament Gallery photographers are participating in the exhibition – Mikhail Domozhilov, Mikhail Protasevich, Jana Romanova, Anastasia Tailakova, Alexander Veryovkin. These partner organisations represent new developments in the artistic infrastructure of the city. 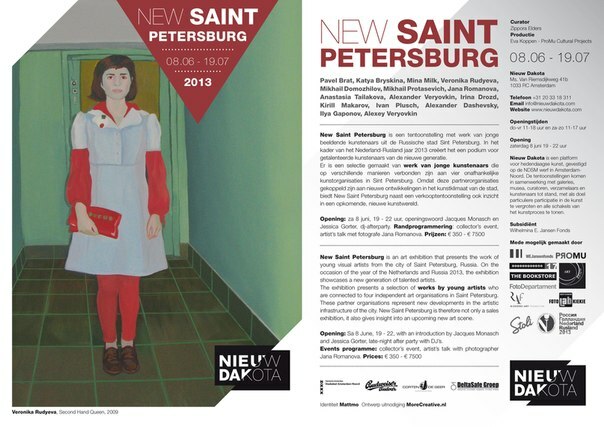 New Saint Petersburg is therefore not only a sales exhibition, it also gives insight into an upcoming new art scene.